Potatoes(Aloo) tend to go without notice - barely visible thorough roasted chicken, theside kick to a beef steak, the baked one in Tahari, or aromatic in aloo gosht, the major veggie in PaniPuri. They make every dish flawless and graceful. They add a charm to every dish we cook. Potatoes are cheap, plentiful, and effortless to prepare, yet, most of never take advantage of their potential. Ignoring an international arsenal of potatoes recipes, we dig the rut of our cooking routines, deeper by mindlessly repeating the same recipes, and boiled potato dishes year after year. 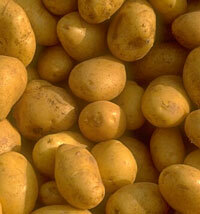 Avoid potatoes, with soft spots, deep pits, and bruises. Sprouting indicates age and is often accompanied by softening of the potato. A green tinge to the skin of a potato comes from the alkaloid solanine, produced when a potato is exposed to light for extended periods. Some sensitive people have allergic reactions to solanine, but to allof us it is a bitter, unpleasant taste. So always store potatoes away from light. Store potatoes at room temperatureif you must, but they store longest when kept cool and dry. The best storage choice would be a Paper bag or a wooden box kept on a shelf in a cool place. At room temperature, some potatoes will sprout and shrivel in as little as a weekand in the refrigerator, their starch breaks into sugar, which destroys the taste and texture of the potatoes. Potatoes are bland. They need salt, and pepper to be palatable and they often require liberal seasoning. Soak 2 lbs. scrubbed potatoes, slices paper-thin, in 1 quart ice water mixed with 1 tablespoon salt. Pat dryand fry in 375 F, oil until golden and crisp. Drain on paper towels and saltlightly. To make the potato chips spicy,season with mixture of 1 teaspoon each salt, cayenne pepper, crushed/powdered chat masala, and black pepper. Saute cumin seeds in oil over medium heat for 30 seconds or until browned. Add the potatoes and stir until the seedsare about evenly distributed over the potatoes. Add the ginger, turmeric, and cayenne pepper. You can vary the amount of cayenne pepper to suit your taste. Stir frequently, adding the tomatoes and onions. Continue stirring, and add the amchur powder and jalapeno pepper. For a more mild version, it is possible to omit the pepper. Add the lemon juice while stirring. Cook for about 2 minutes more and serve hot. Beat the yogurt well and keep aside in refrigerator to cool. In a little oil, fry cumin seeds, green chilies and ginger-garlic paste for 2 minutes. 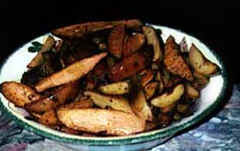 Peel potatoes and cut into small pieces and fry in the above paste. Add salt and mix well. Remove from heat and let itcool. Add the potato pieces to the yogurt and mix well. 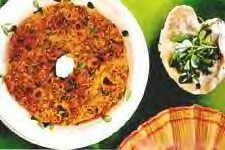 Serve with vegetable pulao. Boil, peel and mash the potatoes. Soak the bread in water, squeeze the water and crumble finely over the potatoes. Add salt to taste, the green chilies and chopped coriander. Mix well and make asmooth dough. Set aside. Now prepare the stuffing. Fry the onions in the oiltill light brown. Mix in the ginger, green chilies, powders and salt to taste. Fry for 1/2 a minute and add the boiled green peas. Mix well and remove. Shapethe potato dough into rounds, put the stuffing into the center of each round and cover with more dough. Smoothen into rounds and shallow fry till brown andcrisp. Serve hot with tomato ketchup or chutney. Sieve and mix the flours together in a mixing bowl. Add salt, sugar and butter. Mix well with the flour till butter blends. Gradually add water and knead to asmooth dough. Pat and knead well for several times. Use ghee or oil while mixingthe dough instead of butter. Cook potatoes. Peel and mash. Heat little oil and season with aniseed and thenfry ginger garlic paste. Add mashed potatoes with salt, turmeric powder and Garam Masala powder. Fry for few minutes and remove from fire. Mix minced green chilies and finely cut onions, coriander leaves to the potato mixture when it cools down. Make medium sized balls from the dough. Flatten each ball and keep a tablespoon of filling inside. Close and seal well all around. Press and dredge in wheat flour and roll outinto thick Parathas. Heat a 'tawa' and fry these Parathas using oil for bothsides while frying. Serve hot. Take one ball and roll into thick and 3 inches width chapatti. Make another ofthe same size. Place a tablespoon of filling on the middle of one chapatti. Carefully spread it leaving 1/4 inch gap all around. Keep another chapatti ontop. Using little water carefully seal both the chapattis all around. Dredge onflour and roll again into big Parathas. Fry on hot 'tawa' using l/4 tsp. of oil for each side of chapatti. 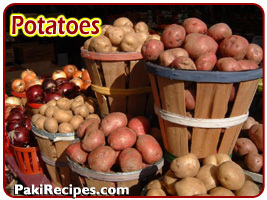 Enjoy these potatoes recipes. Don't be a couch potato!